The Solution to your pest management problem starts with the initial visit to your home in which we will thoroughly inspect and treat all infested or susceptible areas. We custom tailor our service to your unique pest problem. Our Comprehensive Annual Services can be performed on a monthly, bi-monthly or a quarterly basis for the control of all of the following pests: Ants, Roaches, Scorpions, Earwigs, Silverfish, Crickets, Fleas, Ticks, Umbrella Wasps, Centipedes, Millipedes, Clothes Moths, Black Widow Spiders, and Stored Product Pests (Moths, Beetles, and Weevils). Additional Service Options include the control of Rats or Mice inside, Rats or Mice outside, Gophers, Moles, Ground Squirrels, Slugs and Snails. Specialized Treatments available to control: Bedbugs, Odors, Yellow Jackets, Hornets, Bumble Bees, Swarm and hive removal of honey bees (including Africanized and European Bees), Rodent exclusion and dropping removal. Special or One Time Services are available as needed for any of the individual pest problems listed above. We are Rodent Proofing Specialists. We offer free phone consultation. We offer free Pest Identification. 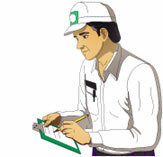 We offer on-site consultation and inspection at a nominal fee.